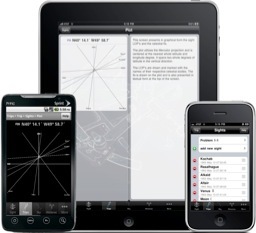 Celestial is a complete package for celestial navigation on your iPad, iPhone, iPod Touch or Android device. It can perform celestial sight reductions, calculate fixes, present them visually, manage sights on multiple trips and assist in sight planning. It also includes a complete Almanac of the Sun, Moon, planets and stars. All this for the price of the Nautical Almanac for a single year! Supports quick sight reduction. Enter all sight values to quickly calculate an intercept or to double-check your own manual sight reduction. Includes a comprehensive trip manager that allows you to manage sights taken during a trip. Keep your sights with you forever! Multiple sights can be grouped and averaged together and a fix can be calculated. Lines of Position (LOP's) and fixes can be plotted on a virtual plotting sheet. Includes a star finder and times of rise/set phenomena. Plan your sights and be on deck when it is time. Includes the complete Almanac of the Sun, Moon, planets, 57 navigational stars, Aries and Polaris for the years 1980-2099. Context-sensitive screen help for every screen so you always know what the intended function of the software is. All sight reduction algorithms are based on the algorithms described in the Nautical Almanac (Sight Reduction Procedures). Celestial object positions are predicted using software from the US Naval Observatory.